I am personally excited and fascinated by the speed with which technology changes, and how it impacts on our lifestyles. Every year, one of the biggest technology shows, CES, offers a glimpse into the future that is shaped by people with creativity and vision: product designers, engineers and all those who make a new product happen. With CES 2017 behind us, there was a lot to take in: from robots and drones to wearables and virtual reality devices. But two technologies stood out to me: autonomous vehicles and digital assistant devices. Given the number of concept cars revealed, it is safe to say that CES has become the unofficial auto show for the tech world. This is also a testament to the fact that the vehicle is becoming the ultimate consumer electronics product. With the advancements being made in bringing autonomous cars to the market, a lot of car brands are focusing on redesigning the vehicle Human Machine Interface (HMI) to address the changing car’s functional interface with the user. 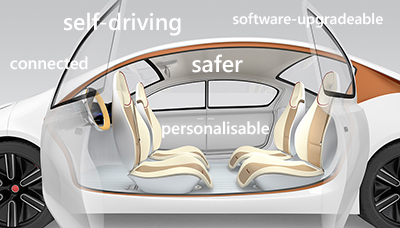 A lot of concept cars at CES conveyed a vision of what passengers would do once they take their hands off the wheel. A trend that was clearly visible at CES was the growing number and size of the displays incorporated in the car interiors - automakers including Honda and BMW showed interiors with giant screens. As output devices, displays will become a key component in the future car interior and a source for infotainment (information + entertainment). This creates a need for their seamless integration in the car interior which leads to a demand for conformable displays in vehicles. Digital assistant devices, which are controlled with voice, were clearly one of the highlights at CES. While Amazon Echo and Google Home aren’t news for consumers Lenovo debuted its first smart speaker called Lenovo Smart Assistant at CES. Digital assistant devices and their uses are still evolving. While improving their software capabilities will be important, there is a lot of opportunity to be creative with the hardware and design too. 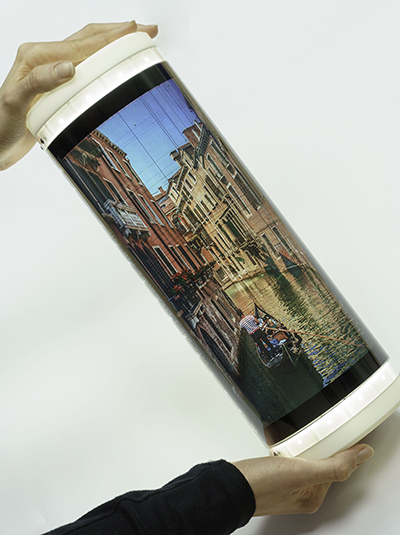 For example one start-up, Aivia, has integrated a touchscreen into their speaker which was launched at CES. A screen is not only an excellent way to differentiate from other similar products on the market, but it seems like a very natural and practical addition to a digital assistant device. With the availability of glass-free, organic LCD (OLCD) technology that can conform to surfaces, product form factor constraints can be removed. This means that the screen can be adapted to the shape of the device and not the other way around. FlexEnable’s team works with partners to create innovative concepts, demonstrators and prototypes using FlexEnable’s OLCD technology. Get in touch with us at info@flexenable.com.